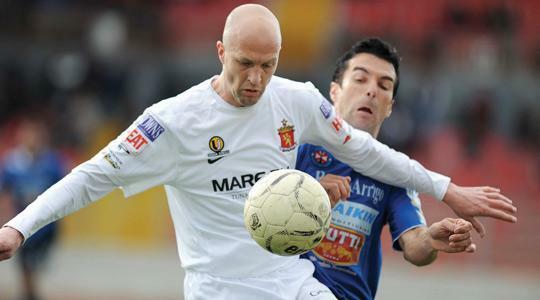 Jordi Cruyff... enjoyed his time with Valletta FC this season. Fitness permitting, Jordi Cruyff will make his final curtain call in a Valletta shirt as the Dutch midfielder has decided to hang up his boots at the end of this season. Cruyff, who first came to prominence as a dynamic winger with Barcelona's youth team, feels the time is right for him to take up a new challenge. "I've decided to call it a day," Cruyff, who is recovering from a minor knee problem, told The Times. "It's likely that the FA Trophy will be my last official competition as a player. "I've accepted a new challenge... I'm going to be the sports director of AEK Larnaca who have just got promoted to the top division in Cyprus. "I'm also signing up for my Pro coaching licence. I've reached a certain age now and my body is starting to protest a little bit." Equipped with a glittering CV that features fruitful spells with Barcelona and Manchester United, not to mention his exalted surname, Cruyff is unlikely to be short of offers. In this context, his decision to embark on a new career is likely to cause a few eyebrows to be raised but as Cruyff told yours truly in an interview before the start of the season, he has never shied away from a challenge. "I've had a lot of phone calls in the past few months and received interesting offers from some very good clubs," Cruyff explained. "People might think that I'm crazy to go to Cyprus but I've always preferred to take a step-by-step approach. This move is part of my learning process. Only time will tell if I'm good enough to work at the highest level but I want to gain experience." Cruyff's move to Valletta had been widely perceived as a boost for the image of Maltese football. Although he is no longer the elusive, agile player he was in his heyday, he nevertheless had a very positive impact in the white shirt as his 12 goals in all competitions amply demonstrates. Valletta's failure to win the league has put a slight damper on Cruyff's Maltese experience but the Dutchman was quick to point out that he has enjoyed his time here. "I'd like to thank the Maltese people, especially the Valletta fans, for making me feel welcome," Cruyff, 36, said. "I'd also like to convey my appreciation for the work of Victor Sciriha and the other committee members. I certainly enjoyed working with coach Ton Caanen, all my team-mates and the backroom staff. "I wish all of them and the club all the best for the future. "I'm disappointed we missed out on the league but I assure the supporters that we will do our best to bring the Trophy to the capital so we end on a better note." Cruyff also hopes that the powers that be intensify their efforts to lift the standards of the local game. "I really hope that the Malta FA put in more effort to make significant steps forward," Cruyff, who also had a very positive spell with Liga club Alaves, said. "There is a need to modernise Maltese football. Several regulations here must be changed to be in line with UEFA rules." Success in the FA Trophy would ensure a fitting swansong for Cruyff who feels that the team's prospects of winning the competition would increase if experienced defender Luke Dimech was in the team. Dimech has been suspended by the club until the end of the season after an altercation with a section of Valletta fans during the 2-0 win over Sliema. "I have to say that I understand the fans' frustration because Luke committed a mistake," Cruyff said. "Players who show a lot of passion are prone to such mishaps but these incidents happen every week in football. "Luke deeply regrets what has happened. I honestly consider him to be the best central defender in Malta and I believe that passionate players should be forgiven. "Our objective is to win the trophy and our chances of achieving that would be a lot higher if we had our best players available and Luke is very important for us."